I won! 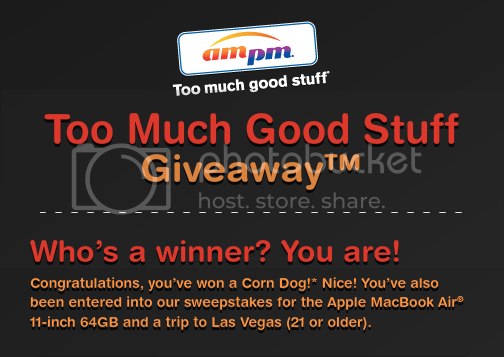 I played the Instant Win game on the ampm facbook page, and I won a corn dog. I've never had a corn dog from ampm, but from everything I'm reading they're pretty good. I just need to find out whether or not I'll actually be able to eat it or if I'll have to give it away to someone. I checked their website and can't find out whether they're all beef or not. And then there's the fact that I'd have to take a road trip to redeem my winnings, since there's no ampm close to me. (insert sad face here) because they look like really nice convenience stores with all kinds of snacks, beverages and hot food prepared on-site. It actually looks like the perfect stop on a road trip. Must be 18 or older to play and 21 or older to win the trip to Vegas, and you can play once per day. So what are you waiting for? This giveaway ends 8/31/11, and they've got some Good Stuff to give away. Go see if you can claim your share.